My husband shared his germs with me and they've done me in. I'm a sad sort of wreck at the moment, all sniffly, achey, and feeling generally out of sorts and all kinds of Blah! 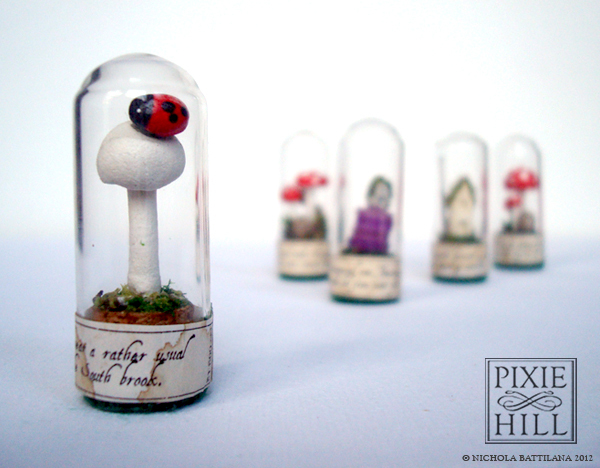 Despite being sick I've finished up a rather large batch of faerie specimens under glass. I've got the first lot up on esty and will post more over the next week or so. No. 016.12 - Noticed growing at the very back of the top desk drawer in the upstairs library. No. 014.12 - Unearthed beneath a pile of odd socks sitting next to the washing machine. I'm off to vegetate on the couch and think about all the things I should be doing. I think watching an old movie and napping will probably do me better than housework this afternoon. I'll leave you with a lovely photo of the our lovely crooked house taken this past weekend when the world was fluffy and white. Your specimens are brilliant. I want a museum filled with them. 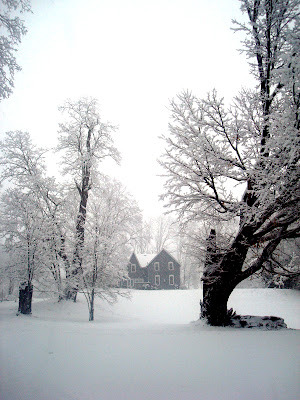 Your house looks so peaceful covered in all that snow. Love the new specimens! Your house reminds me of something from a beautiful novel! I would love to live there!